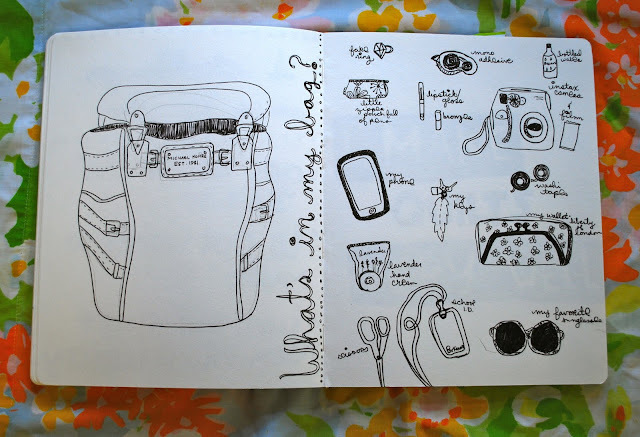 Journal Prompt: What's in my bag? This is always a fun little blog post that I see all over the internet. I love seeing what's in other people's bags. These are the things that are important to people and what makes them, them! Today we are going to document it on paper instead of our blogs ok? As you can plainly see, I remembered to use a pencil first before I drew my bag :) I haven't ever drawn this bag before and wasn't feeling confident enough to free-hand it like I did with the rest of the page. After I drew it with pencil, I traced it with my pen, and then realized....I do not own a single eraser! 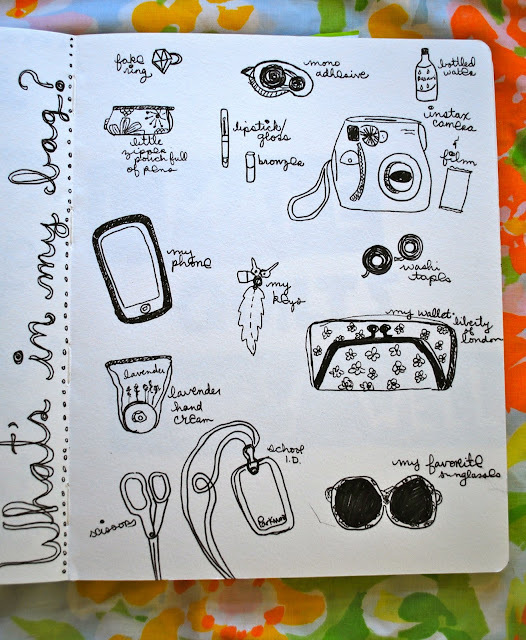 So, what's in your bag?? I'm so excited that I'm all caught up except for the scavenger hunt and now this one. I just uploaded all of my photos of my pages onto flickr and into the group. I'm really trying this time. I'm even going back after this class finishes and I'm going to finish the ones I didn't get to finish. I hope I'm getting my "journal bug" back. school id- what school do you go to?